Working away on the Wave scarf. Looks much as yesterday, but longer. I have however found my Heirloom Knitting book. I’d swear the knit gremlins stole it and then replaced it because it turned up on the shelf where it was supposed to be, in a spot I had checked a half-dozen times before. I am sorely tempted to use one of the wider Wave family border variants shown in the book instead of the elegant but simple one included in the pattern. We’ll see what happens when I get there. In the mean time I continue to work on wiseNeedle. I’m tinkering with the KnitWiki’s structure (on paper). I want to get the skeleton logically organized before leaping into populating the thing. I’ve also been answering old advice board questions. There’s a spotty backlog of about a year, mostly inquiries that were stuck behind the junk entries. I am sure I’ve surprised some folk who posted their questions years ago, requesting that answer notifications be sent to them by eMail, who then never got an answer. More than a few out-of-the-blue notifications have arrived this week past. On the yarn review side, I’m slowly adding basic info for as many of this season’s yarns as I can find. I’ve put in about 130 this week past, but have barely scratched the surface. 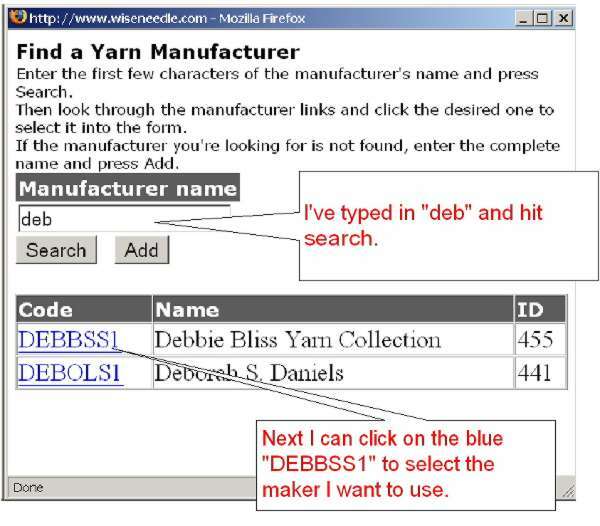 I do note that people continue to be confused about the yarn maker list. There are hundreds in the collection – far more than the top 10 or so that appears on the drop-down list. In an effort to clarify how to use the thing I repeat some of the info from the how-to page. The list of makers that appears on the drop down is a list of convenience only. It’s automatically generated, and changes as more yarns and reviews are entered and posted. We do not alter this list in response to manufacturer requests, nor do we put forward this list as a “short list” of recommended manufacturers – it’s based on a flat-out census count of yarns in the database only. 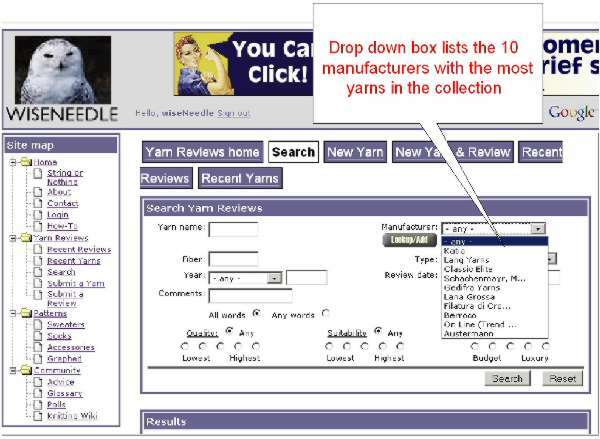 To look up a manufacturer that is NOT on the top-ten list, we provide a handy search utility. Click on the “Lookup/Add” button next to the “Manufacturer” field. A small secondary window will pop up. Type in the first few letters of the manufacturer’s name and then click on the “Search” button in the little window. A list of manufacturers with similar names will pop up. Select the one you are interested in by clicking on its blue code name. Babajoes is under Merino Sheepskin Co, Ltd.
DGB is under Difference G. Brui, Inc.
McGregor is under JL McGregor, Ltd. When you click on the manufacturer’s blue code name, the little search window will close and the “Manufacturer” field on the main form will be filled in with your choice.